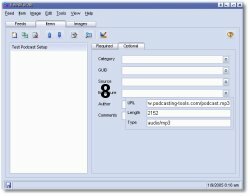 Videocasting is simply distributing video content using RSS. 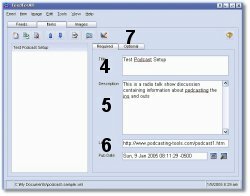 The process is suprisingly simple, and by making video content available using RSS, videocasters give listeners more control over what they listen to and when. 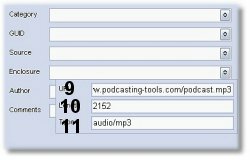 Also, many podcasts are available for syndication, which increases a broadcasters exposure. 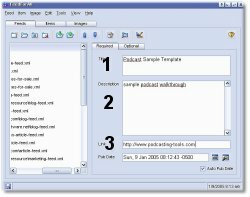 Videocasting is simply an RSS feed that contains an video file in the enclosure tag. The following is a step by step tutorial that explains how to setup your videocast. 2. Enter a collective description of all the video files contained in the videocast. 3. Enter the URL of the website or webpage you want associated with the videocast. 4. Enter a title for this specific videocast or video file. 5. Enter a description of what the video file contains. 6. Enter the URL of the website or webpage you want associated with this video file. 8. Click the 'Enclosure' field a list will automatically drop down. 9. Enter the URL of the video file containing the video content. 10. List the file size of the video file. 11. List video and the format of the video file. go back to main tab. 12. Save and FTP the feed to your server.